Home military From Enlisted to Warrant Officer. In December, Rob will celebrate two years of being a Warrant Officer. Which also means he will pick up another rank and the official Chief title. It's hard to believe it has already been almost two years since Rob completed Warrant Officer Candidate School and recited the Oath of Commissioned Officers, officially crossing over. Rob went from a Staff-Sergeant in the United States Army to a Warrant Officer. Which also means he went from the enlisted side of the Army to the officer side. Watching him go through this process, rooting him on every step of the way and experiencing the transition with him... here are my five biggest take aways. 1. Your person has been selected! The easy part is done. Warrant Officer Candidate School is a HUGE test for not only your soldier but for family too. The five weeks of WOCS is a lot like basic training. Your soldier will be put through a lot and you will have little to no communication when they absolutely need it the most. So make sure you send them off with lots of love and praise. 2. Nothing big changes for you, the spouse. Rob went through this transition while we were stationed at Fort Gordon. Our situation was unique in that Rob's Warrant Officer Basic Course (the course AFTER WOCS that is job specific) was also at Fort Gordon. Which means we did not leave our prior military community behind. Technically speaking Rob is supposed to follow certain guidelines for fraternization outside of work. But me? Those rules don't apply. No friends or prior-acquaintances were dropped as a result of Rob's career advancing. 3. Some things do change. For example... the Fort Campbell Spouse Club membership dues. Prior to Rob going warrant I would pay $20 as an E6 spouse to be a part of the club. The FCSC groups WO1-WO2 in the lower category and I actually only pay $15. The same thing happens with MyCAA. Before when Rob was an E6, I did not qualify. But when he became a WO1, I now quality for funding. It's super random... but sometimes pleasantly surprising. On the flip side of things, we sometimes find Rob's rank groups us in with higher prices. Most military golf courses divide their rates up based on ranks. A dollar or two here or there though isn't going to break ya, I promise -- but do take advantage of free school funding if you need and or want to! 4. Find a current Warrant Officer spouse and use them as a mentor. I've said several times that the ladies I met while at Fort Gordon were a HUGE help before, during and after this transition. One of my favorite ladies checked in with me the morning the list came out. Looking back on our conversation after the list was released, she knew he had been selected and was setting a positive tone for that morning and the rest of the day. Fort Gordon has A LOT of signal Warrant Officers. Fort Campbell does not. Fort Campbell has a lot of aviation Warrant Officers - none of which my husband works with. So needless to say, it has been an entirely different world here. Which is really a post for another day. Regardless, knowing other Warrant Officer spouses helps. 5. All the Warrant Officer stereotypes? They are true. They drink a lot of coffee. Have their own rules and standards to follow on top of Army wide standards. And are rarely seen by the average soldier (Warrant Officers are technical and typically do not have many soldiers that fall underneath them). Watching Rob complete this journey was stressful and hard. But I am so so proud of him for getting through it. 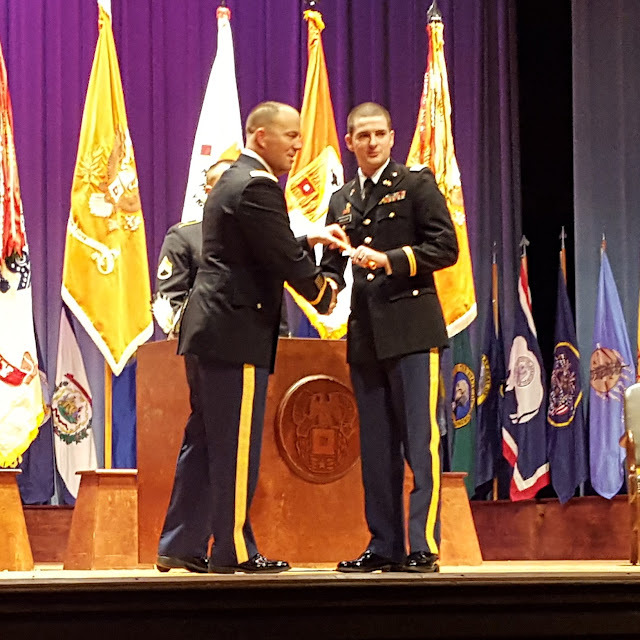 He achieved his goal of becoming a Warrant Officer and excels everyday at his job. If you are a spouse about to embark on the Warrant Officer support system journey.... shoot me an e-mail and I will send you the long and short of what you need to know. Warrant Officers are definitely in their own category when it comes to the Army, because they are technical and specialized in their field. It is amazing to see the differences when you are on the officer side, and sometimes it can be frustrating. I actually have a post coming up about that. My husband is wanting to do Green to Gold so it will be interesting seeing the changes from the enlisted to the officer side. My friend's husband was an LT, switched to Warrant Officer so he could do aviation, and I think is going back to LT again. This is awesome! Your husband rocks! MH will be leaving for some training like that this year. I've never not talked to him since we met in 2012. This should be interesting! It really is a different way of work life, yes. We are in a similar situation. My husband was a staff Sgt aND in February of this year he pinned his 2. There are some times when he can come home as early as 1600 but then there are times when it is 2000. He gets less respect I think as a wo1 than when he was a staff Sgt because he gets put in the same class as an Lt who juse entered the army aND doesn't know much about it. Now as a cw2 he gets more respect. The problem we have is that "the quiet proffessional" does such a good job at being quiet, he does not get recognition for what he does. This was great to read. My husband isn't sure if he wants to make a career out of the Army or not, but he said that if he does, he wants to go the Warrant Officer route. Christopher's experience from enlisted to officer has been night and day. He loved being a Cav scout. He excelled at it and it brought him so much fulfillment. His time being an officer in a support unit sucked it right out of him. I feel so bad for him.